If you’re the kind of investor who has the patience and discipline to stay with a stock for the truly substantial long-term gains … if you’re not a get-rich-quick, instant gratification type of person … if you are an intelligent investor … then value investing is perfect for you. And you’ll want to learn from the greatest value investors ever. Chances are you know who Warren Buffett is. Buffett made one successful investment after another using Berkshire Hathaway (BRK-B) as his conduit. He became adamant that his stocks provide a wide margin of safety. The intrinsic value of a company must outweigh the company’s stock price. He learned that strategy from one of his stock market-savvy Columbia professors, Benjamin Graham. Get the secret of buying stocks like the greatest value investors of all time—sound and safe investment for the intelligent investor. What is it that made Graham’s value stock picking so special? In short, he systematized the entire process of evaluating companies, all with the goal of finding low-risk (or no-risk) investments that would reward over the long run. He had six specific factors that he used to quantify a business. 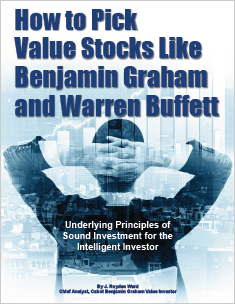 You can read about these factors in this special report, How to Pick Value Stocks like Benjamin Graham and Warren Buffett, Underlying Principles of Sound Investment for the Intelligent Investor. The objective of Graham’s strategy is to identify unappreciated stocks and show you how to find undervalued stocks that meet certain criteria for quality and quantity … stocks that are poised for stellar price appreciation. He developed seven time-tested criteria to identify these strong value stocks. Find out what these criteria are and how you can apply them to your own investing when you read this special report. Learn more about Ben Graham and Warren Buffett and how you can apply their principles of sound investment to your value stock portfolio. Get this FREE report today.